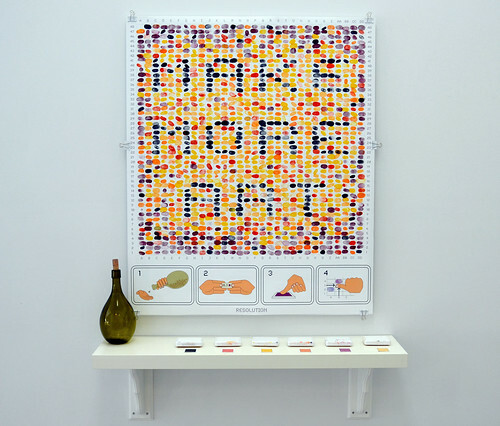 Resolution, by Danny Saathoff, is an interactive piece of art featured in last month's Message In A Bottle show. The piece started off as a massive blank grid and visitors were invited to select one of many small, rolled papers from a bottle. Each piece of paper contained a set of coordinates with colors assigned to them, and visitors used their fingerprints to reveal a hidden message. As the piece slowly materialized, visitors eager took turns leaving their mark, sharing thoughts and speculations about what the final image would reveal. Danny is an amazing artist, from concept to craft, who encourages viewers to slow down and interact with art. This piece is a perfect example of involving everyone in the art-making process and in the end, invites them to continue to make more. You can see more of Danny's work on his website.